Generate over 100 paid Summer Internship opportunities each year for Scholars Club students enrolled in the public school systems of Southwest Florida. Coach of a Gold Medal Tennessee select soccer team (under 13), 1984 McDonalds Youth Soccer Olympics. Recognized as a "Tennessee Olympian" by the University of Tennessee, Knoxville for this achievement. "Scholars Club, A Culture of Achievement Among Minority Students," (With Madelyn Isaacs), The School Counselor, January 1995. "CEOs and the Caribbean Export Firm", Roger Calantone (Ed), 1984 Proceedings, Mid-Atlantic Marketing Association, Orlando, Florida. "Disadvantaged Business Councils assignment a painstaking process", Guest Opinion, News-Press, Sunday, June 11, 1995. Scholars Club is the premier academic organization for minority and "at risk" students in Southwest Florida. The principal objective is to promote and support attainment of a peer culture of success among students. As of Fall 1998, there were 57 Chapters of the Scholars Club in Lee, Charlotte, Collier, Hendry and Glades Counties in southwest Florida. Other Florida chapters exist in Sarasota, Palm Beach and Hillsborough Counties. Outside of the state of Florida, Chapters exist in New York, Pennsylvania, Iowa, Kansas and Washington. Generate over 100 paid Summer Internship Opportunities each year for Scholars Club students enrolled in the public school systems of southwest Florida (see attachment). In Summer 1996, 129 opportunities, generating over $300,000 of summer compensation was facilitated. Recognized by the University of Tennessee, Knoxville, as a "Tennessee Olympian" for being the winning coach of a gold medal Tennessee select soccer team at the 1984 McDonalds Youth Soccer Olympics. accomplishment. Duffus runs hurdles for the Houston Lady Cougars track and field team and has already provisionally qualified for NCAAs this year. out as a sprinter, but was persuaded by Dave Hunt, her coach at the Cedarbrae Collegiate Academy in Scarborough, Ontario, to switch to hurdles because he saw potential. Canadian Junior Champion in 1993, and represented Canada in the 1994 World Junior Championships. Duffus said she came to Houston to run for the Lady Cougars because she felt this would be the best place for her. "I have a lot of faith in the track program at (the University of Houston), and a lot of confidence in the coaches," Duffus said. 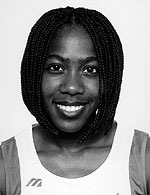 teammate Vernella Rolle. "(Rolle) has given me a lot of advice and confidence in my abilities," Duffus said. Duffus is also an honor-roll scholar. "I keep my grades and my hurdling in balance. They are both very im- portant to me," Duffus said. She has been able to balance them well, maintaining a 3.7 GPA last semester while gaining esteem for the Lady Cougar track team as well. In her free time, Duffus said she likes to relax by hanging out with her friends and her boyfriend. She said she also likes to spend time playing with her chow dog, Foxxy. Though Duffus said she longs for the food and atmosphere in Canada, her time in Houston is important to her. Duffus sets high standards for herself. She hopes to do well at Nationals this year and to make the Canadian World Team. In addition, she has set her sights on representing Canada in the 2000 Olympics. Though Duffus excels in many areas, she manages to keep herself focused. "I love track," Duffus said. "If I go all the way, it is meant to be. I will not lose sight of the importance of education, because that will be important to my future."